I love quick and easy slow cooker meals and this is seriously as easy as it gets! Elyse shared a Ranch Pork Roast recipe a long time ago and so I modified it to what I had available in my pantry and this dish was born! The pork chops literally fell apart when you cut into them and the extra sauce made a perfect gravy. Easy dinner at it’s finest! These pork chops literally fell apart when you cut into them and the extra sauce made a perfect gravy. Easy dinner at it's finest! Spray your slow cooker with non-stick cooking spray and put potatoes on the bottom. Mix together the soup, ranch dressing mix and milk. Pour on top of the pork chops and cook on LOW for 6 hours. 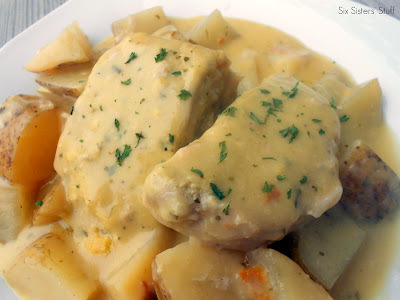 Use the extra sauce in the slow cooker as a gravy for the potatoes and the pork chops. This is one of my favorite recipes. Love it! I need some more slow cooker recipes to try. That's awesome that you also shared the home made versions of the packaged items as well. Thanks for sharing! If you want more recipes go to crockpotking.com, I have a bunch of e books that give a lot of ideas to! It's recipes like this that make me second guess being a vegetarian! Hi Amy, if your a vegetarian try crockpotking.com, as well they have a few recipes. And if you have any Vegan slow cooker recipes please post them, can't get enough of them! This recipe is sooooo delicious. It cooked a lot faster than 4 hrs for me, which was good because it smelled so good my family couldn't wait to eat it! Have you tried the recipe with chicken? I am going to try that next. Ooooh I love the homemade Ranch! Homemade recipes are priceless ...thank you !! this looks so goooood! just pinned it- I'll be making these very soon! I don't have a slow cooker )= Can I make this in the oven? I think that it might work, but I have never tried it! Let us know if works! This has become a regular dinner in our home!! Love it! Trying this recipe tomorrow for Sunday dinner...looking forward to it!! Can I make a freezer meal out of this by throwing everything together and freezing it in a bag? And then eventually thawing it to throw it in the crockpot? This recipe is from Picky Palette , you adjusted it, but you still need to giver her credit! I know this might be hard to fathom, but recipes that involve so few ingredients - particularly since this one involves two very common prepared foods to use in a crock pot - are often arrived at independently. Something similar to this was probably created decades ago, not by picky palate. Perhaps get off your internet high horse. The source that THIS PARTICULAR blogger adapted this recipe from was cited. Your baseless accusations are unhelpful. Aside from that, after googling the recipe you refer to, this recipe is in fact different enough from picky palate's to be considered an unique creation. Hi there! Thanks so much for sharing this AND the homemade versions of the soup and dressing mixes! I do have a question: I know flour sometimes breaks down over time in a crock. Has anyone tried making this with the homemade soup mix, and can you add the soup at the beginning of the recipe as you would canned? It we definitely be great if so, but I could also stir it in later if needed. Just wondering if anyone has tried it and how it worked. Thanks so much and I love your site! Thank you for adding the homemade versions of the soup and dressing mixes. I always want to try recipe with these but am hesitant because of the msg. Also, thanks for the fabulous recipe! This was SOOOOOOOOOOOOOOOOO good!!!!! My favorite recipe yet!! our oven is currently broke so recipes like these are great. made this last night and it was so good and so easy. ive never been a big fan of pork chops but i will totally eat these! I'm so glad I found this on Pinterest! I usually just use cream of mushroom soup, but the cream of chx and ranch was really good! I used one packet of ranch seasoning and one of the homemade version. Pork chops were tender and delish. This had my place smelling so good while it cooked and I couldn't wait to eat! Made this recipe yesterday and...AMAZING! My husband practically licked his plate clean! Ok, so I made this today and it wasn't as good as everyone else's :( the meat was tough and potatoes not cooked. I cooked it for 4 hrs on high. Sorry it didn't turn out as what you were hoping. We cut the potato into about 8 pieces. It sounds like you didn't cook the dish long enough. I thought the pork was amazing but you do have to monitor the cooking time. The pork temperature will register at 165º but still seem tough. During the last hour of cooking the meat will become tender and potatoes will finish cooking. Every slow cooker is a bit different, try increasing the cook time an hour. I made this last night for dinner. I did end up cooking it longer because the potatoes were not done. My kids were not happy about waiting past regular dinner time. However, it was so yummy! I added baby carrots and a little chicken broth as well. It was worth the wait. I will just start earlier or cook on high for the same time as was suggested for low setting. I've been told not to freeze uncooked potatoes as they don't freeze well. And so.... I'm wondering the same as LavenderDiamond above.... Can I freeze this in a freezer bag and cook in a crockpot later? We have never made this as a freezer meal, but it should work great. Just make it and stick in a freezer bag. Then thaw and cook thoroughly. I put this in my crock pot this morning. I just panicked a little because I just read that you put your potatoes on bottom. My pork chops are on bottom and potatoes on top. Hopefully it turns out ok! The flavor is good,though a little too salty and I dont get a distinct ranchy flavor even with two packets. Also, next time I may just use 1 can of soup, I am a saucy girl but I feel like it was a lot. I tried this today but used one can mushroom soup and one chicken, also put onions one top and a lil cayenne pepper. Will see how it goes. Also just one pack ranch. Can you put the potatoes on the top instead? I have already added the pork chops with the soup mixture, and forgot to do the potatoes first. Hi Nancy, you should be fine. Since the potatoes are cut into large pieces, you could kind of stir it around a little so some of them go under the pork chops. Hope this helps!! Have a great day! Loved the flavor of this one. I'm always game for making tender pork chops - my history with them has been very dry. So this was great! hi, i wanna make this tonight, but i was wondering what i can substitute for the porkchops? we love ranch & potatoes but don't eat pork...chicken? if so, what type of chicken? Also, Can i cut the quantities down - 1 pgk of ranch, 1 can of soup? thanks!! Chicken breasts should work with this recipe. Hi, So can I use Ranch Mix mix instead of Ranch dressing mix? You use the dry ranch dressing mix. I've made this with chicken as well and it comes out great. I do 6 hours on low. Made this last night and it was so good!!!! My kids loved it and my husband loved it also! It was a hit!!! Thank you so much!!! Does the recipe mean 2 16oz packets of the dry ranch seasoning rather than 2/1oz packets ? The dry ranch dressing packets come in 1 ounce packets. So you will need 2 of them for this recipe.